Microsoft introduced the personal assistant Cortana in 2015 when it released the Windows 10 operating system (and even earlier on Windows Phone). Just like Microsoft tried to get a fast start with Windows 10 by offering it for free, it attempted to push Cortana by integrating it deeply into the Windows 10 operating system. Microsoft merged search with Cortana so that any user who used search was exposed to the personal assistant at the same time at first. Windows 10 users could use Cortana for a variety of tasks, e.g. for answering questions, set reminders, or to control music. The tight integration was not enough to establish Cortana as a competitor to Amazon Alexa or Google Assistant; Microsoft CEO Satya Nadella made the decision to reposition Cortana. Instead of playing catch-up with the two dominating assistants, Microsoft will now attempt to make Cortana a skill that is compatible with these devices. The company integrated Amazon Alexa already with Cortana, and it plans to do the same for Google Assistant. Integration would improve Microsoft's reach significantly and users could integrate Microsoft products, e.g. Outlook functionality, with personal assistants that they have at home or work already. The Verge reports that Microsoft would like for Cortana to become available as a skill of other digital assistants, like Microsoft "apps on Android or iOS". Current Windows 10 Insider Builds confirm a change in strategy. Microsoft plans to split Search and Cortana in Windows 10 version 1903, the upcoming version of Windows 10. Instead of launching the new version of Windows 10 with Cortana and search combined, Windows 10 version 1903 will have them split. Users who want to run searches can do so without having to deal with Cortana, and those who want to run Cortana can activate the personal assistant without having to deal with search. Microsoft wants Cortana to become an essential skill, not only on Windows devices but also on mobile devices and smart speakers. 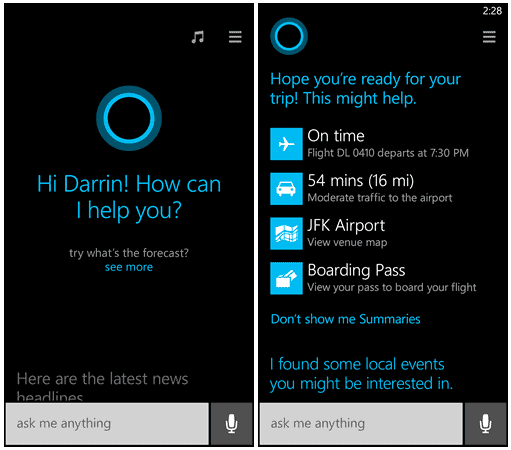 Cortana could become an interface to control Microsoft services using non-Microsoft digital assistants. Only time will tell if that strategy will be more successful, or if Microsoft will retire Cortana in the coming years. I don't use personal assistants and have no intention of using them at this stage. Now You: Do you use digital assistants? Microsoft CEO Satya Nadella revealed plans recently to reposition the digital assistant Cortana in the personal assistant market. I don’t use any personal assistants and have no intention of using them either. I’d consider using a personal digital assistant like Alexa or Assist if my user data wasn’t collected and sent back to Amazon, Google and Microsoft. I conceive the very assistance concept as valuable only when called, that is free of self-initiatives, non intrusive. if I buy a plane ticket for Los Angeles I don’t want whoever or whatever to ask me if I’d wish to drop in San Francisco (“Hey! : Minus 25%!”. If I want to continue to Frisco I’ll ask, otherwise: move off. We see this assistance syndrome everywhere nowadays, another way to push people under the pretext of helping them : who do these deciders think we are, kids, idiots? Assistants : go home. If i need you I’ll call you. they really do seem (to me at least) to be wolves in sheep’s clothing. Perhaps they could be, or are helpful as accessibility aids, but, even though I’m fat and lazy, I do things for myself. I despise digital assistants. I was late with getting Win10, purposefully, and I hate it. Thanks for the article on shutting up Cortana. It’s really nice not seeing it in the Task Manager any longer. cortana reminds me when to pay my bills. once, while standing in the shower with a head full of shampoo, my water went off – cortana had forgotten to remind me ! Do they come not connected to nsa…i mean…. internet? No wireless also !! The voice to text accuracy has finally gotten high enough to make it useful and I figure google has already got so much data on me that they really aren’t going to get much more. There’s also “Android Auto” now that lets me answer calls and text hands free and has a simplified and enlarged ui. The phones mic, camera, and gps can all be operated without my knowledge or consent anyways so I figure, Just go with it. You can’t stop the collectors (without totally living off the grid) but you can manipulate what they collect. Change is like a wave, stand still and it will just wash over you. It’s better to ride it and get what you want out of it. Cortana has no future, just like the Zune, Danger, band, Kinect, Windows RT, Windows Phone..Surface. No sane iOS or Android user will use Cortana on his device. The Majority won’t use anything Microsoft on their devices. What is that statement supposed to mean? It seems to be pure marketing gibberish. “skill” is the equivalent of an “app” for Alexa/a digital assistant. Yes, you’re correct. So is lehnerus2000 — calling applications “skills” is pure marketing gibberish.